An established polar explorer and adventurer who operates within the extremes of our planet. His next expedition to Mount Everest will involve students from around the globe - this journal was set up to link directly with the teachers, students and the scouts who are involved in the journey. I put aside 4 weeks to train in the mountains prior to the ascent of Everest for some very simple reasons. The team I will be working with on Everest are pretty fit guys so I first of all don’t want to let them down and also the work I put into the pre expedition can only benefit my performance later on. However, heading above 6000 to 8000metres is a different world and you never know how your going to react up there. So like a lot of things I do in life I try and cover as much as possible in the preparation so if things are not quite going to plan then at least I can live with the knowledge that I covered all angles. Those high altitude moments are still a good 3 to 4 weeks away but it’s been on my mind from the second I signed up. The moment will come quickly too as no matter how hard you think or prepare the clock still ticks! I’m now back in Namche Bazaar- the tri market village at 3400m. A hub of activity that trekkers / climbers long to to be in after a few weeks in the mountains. Hot showers and good food – in short comfort. Which is ok if your heading home but if your back up on the mountain in a few days and into the cold then for me it feels like I am weakening- stepping out of the zone. I said the above to somebody today and they said you’ve worked hard, reward yourself and rest your body. Good words – it’s difficult to manage that sometimes when you work alone. I was going to go the whole hog and get a massage but when I was in my first hot shower for 3 weeks last night I stretch my body and heard my spine “click click click” into place. That saved me a bit of money. Health wise I feel great – super great. I know I need another 2 weeks of up and down mountains to be completely satisfied and I am also aware that once I start to work with the ascent team my fitness should increase more. Remain a contender and never a champion is something I stick by as this keeps you hungry and focused. I have so much respect for the team I’ll be climbing with and the company ; Himalayan Ski Trek – complete professional. So what am I doing now – this moment? Relaxing with a cappuccino listening to elevator music in a cafe over looking the snowy mountains as the sun beats down. In a few short days I will be up and down a few more mountains before meeting the education team who will be out on the 5 April. I’m really looking forward to seeing them which will turn my trip from solo to 8 people – with a fantastic diverse global education program that covers many more aspects than just our ascent – including a Space Program of all things. But more on that later. Hello to my friends at the Monday Club in Coventry – partially sighted and blind friends from the local community- this blog will be turned into a Podcast for you and for other folk who share the same situation around the country – so you can walk shoulder to shoulder with me to Everest. Also a big hello to Paul – Lisa Baker and George (FF) – the Drayson Foundation and Jon from the greatest rugby club in the UK along with the team at ELF – you guys put me here. I raise my cup of cappuccino to you all. Author Mark WoodPosted on March 28, 2019 March 28, 2019 Categories UncategorizedLeave a comment on Nearing the end of part one. Over the past 10 days I have trekked from below 2000m in the lower valleys to my position now of 4380m. I have another3 weeks heading across passes – climbing up to 5300m and covering different terrains from snow to rock to ice. At the moment I’m on my second rest day which allows my body and mind to acclimatise before a distinct increase in height. This is generally 3,500 / 4,500 and so on in metres. My first rest day was in Namche Bazaar- a busy market town which is a tri junction for locals to come and stock up on their own household goods but it’s also a home from home for trekkers. If I mention burgers – beers – hot showers and music then it might sound a bit of a nightmare if your looking for the peace of the Himalayas but if your out for 3 to 4 weeks it acts as a treat for your own endeavours. Today’s rest day however is a complete contrast. I am sat out side the only open lodge in the sunshine surrounded by white mountains- ground snow and a real sense of detachment from the human race. There are no other trekkers here so I’ve gotten lucky for this short period of time. It’s a pleasure to sit in the sunshine with the perfect view and relax. I have tough days ahead of me not only in my training period of preparation but also for the Everest ascent itself – I also have another 2 and a half months in the mountains so when days like today happen you need to embrace it. My purpose for being out here is of course to try and reach the summit of Everest but we also have over a million students and scouts following the journey- so I want to demonstrate how you prepare physically and mentally for a challenge like this – what is the reason? What are our ethics ? RESPECT yourself – each student is unique and awesome. RESPECT the environment- look at how your own family – community values the environment. Your actions will have a knock on affect to a wider community. THINK DIFFERENTLY- be creative in your own goals – walk away from the crowd and find something passionate in life. HAVE FUN – if not what is the point. As I sit alone with the sun on my face and the mountains sitting quietly around me I completely understand the journey I have in front of me over the next few months – I’m excited and scared at the same time. When I was a child I escaped my house and at the age of 6 walked alone through fields and woods to the local shop. I bought some sweets and made it home safely – this was my first solo supported expedition. The feelings I had that day as a child of butterflies in my stomach – the feeling of excitement and fear is the same feeling I have now – it’s a feeling of change – the child like instinct of what’s around the next corner. Over the next 4 days I will reach 5350 m and each step will be a step towards the summit in a few months time. This Blog is written for any body who finds the time to read it of course but I am also going to read a more descriptive version as a Podcast for the blind societies so they can follow my journey too. Finally I left England on a venture that has taken over 2 years to put together. When I arrived back from the North Geographic Pole in 2016 I had a good outreach of students world wide – it would be a shame to just cut connections with these guys. So a new and bigger project was needed. Yesterday I counted the amount of organisations and educational areas who are now apart of Expedition 8848 – it’s truly grown since the idea popped into my head. It’s been 2 years of highs and lows to point that sometimes I questioned whether it’s actually worth it! Why don’t I just climb Everest instead of creating a global education programme! Well I need a reason to climb and 1.6 million students / scouts is not a bad one. I said goodbye to my dogs which was tough and jumped on a plane which luckily ended up in Kathmandu. The reality kicked in today when I met some of the ascent team and packed my gear. For now I am sat outside a cafe in the busy tourist section of Kathmandu watching the speed of life pass in front of me – soon I will be in the cool of the mountains. At the back of my mind is something that has been there since the seed of the idea was born 2 years ago and will be there through my next 2 months preparation- this is the thought of the final ascent day. All this preparation and hard work to focus on a few hours ascent to the summit – the day when everything comes together. Before the 1865 survey that led to rechristening the world’s tallest peak, the peoples of the Indian subcontinent spoke of it as a goddess, a giant that watched over the world. Known as Chomolungma(Goddess Mother of the World) in Tibetan, Sagarmatha (Mother of the Universe) in Nepalese and Shengmu Feng (the Holy Mother Peak) in Chinese, Mount Everest is indeed the mother of all mountains. Other translations include “head” or “sky” in their names, giving it an otherworldly quality and humbling our own existence in the shadow of its majesty. Its sheer size is unparalleled; its lesser counterparts like K2 do not come close in either enormity or supposed divinity. Its reputation among the Himalayan peoples reached the ears of Sir George Everest, the Welsh-born Surveyor General of India from 1830 to 1843. At that time, western geographers prosaically referred to the mountain as Peak XV, which hardly did it justice. During Everest’s entire career, Kangchenjunga was considered the tallest mountain in the world, but in 1852, an Indian surveyor first calculated that Peak XV was much higher. It took several more years of checking and re-checking before its prominence was widely accepted. In 1865, the Great Trigonometrical Survey — a multi-decade project to measure the entire the Indian Subcontinent, including the great mountains of the Everest region — neared completion. Often the British picked local names, as with Dhaulagiri, but this new mountain had so many identities that rather than choose one over the others, the new Surveyor General, Andrew Scott Waugh, named it after his mentor and predecessor, although Everest himself never participated in its survey. Andrew Scott Waugh, Sir George Everest’s successor. In a memoir, Waugh wrote, “In the meantime, the privilege as well as the duty devolves on me to assign…a name whereby [the mountain] may be known among citizens and geographers and become a household word among civilized nations.” While Sir George Everest himself — who continued to modestly emphasize that he had nothing to do with its measurement — would have preferred a more traditional or indigenous name for the mountain, the name Everest stuck. A hundred and fifty years later, it has come to symbolize wonder and ambition. Despite Everest’s lack of involvement in the project, his reputation as one of the world’s most accurate mapmakers at the time earned him the honour. Remarkably, the way we say Everest today is actually a mispronunciation. The proper Welsh pronunciation of the Surveyor General’s surname is ‘Eeve-rest’, but it eventually evolved into ‘Evv-rest’. Phonetics and irony aside, Everest has become a holy pilgrimage site for all mountaineers and thrill-seekers, and continues to dominate the mythology of the communities living its shadow. The following article was posted on the BBC website on the 24 December 2018. It was written by film maker Tom Martienssen who is also my climbing partner on the next Everest expedition. 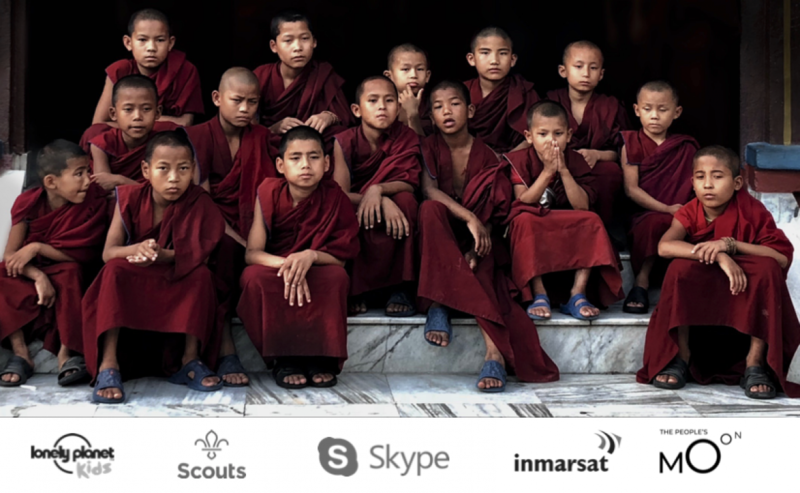 The reason for forming it as a blog is so the students and teachers who are following the journey of Expedition 8848 can access it around the world. 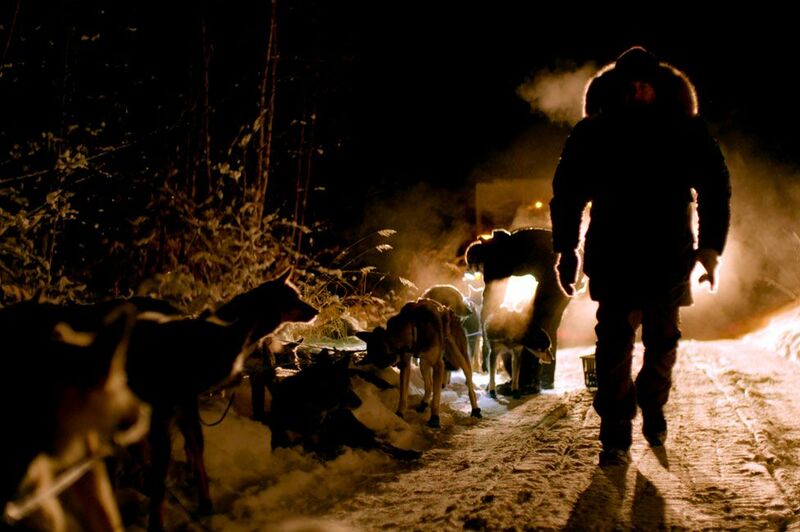 The centuries-old tradition of husky racing is alive and well in the US state of Alaska. But a changing climate means the competition season for these canine athletes is shrinking, writes Tom Martienssen. A cold snap whips between the trees, making the most of a clear patch of ice. It was a lake in summer, now it’s a smooth sheet of white. The sled whispers through the snow, broken only by the panting of eight dogs working in harmony, pulling Paige Drobny on her custom-build race-sled, built by her husband and fellow racer, Cody Strathe. 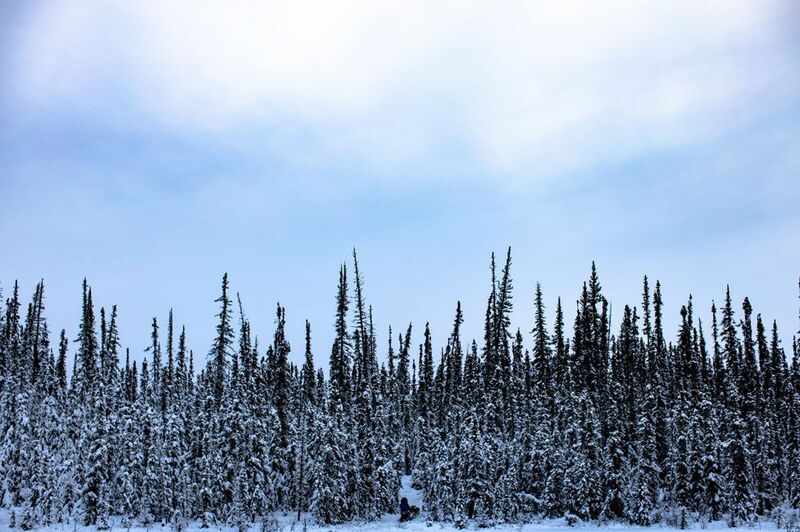 This is Alaska, not far from the city of Fairbanks. Dog sled racing is huge here – the local breakfast diner features a life-size model of a racer and the bars are adorned with men and women snow-beaten and sleep-deprived, surrounded by their loyal huskies. Anywhere outside the US and it would be considered a national sport. And in some ways, Alaska does feel like its own nation, mysterious and remote. Only a little more than one person per square mile on average, according to the US Census. Cody and Paige are well into their training for the season’s biggest races. 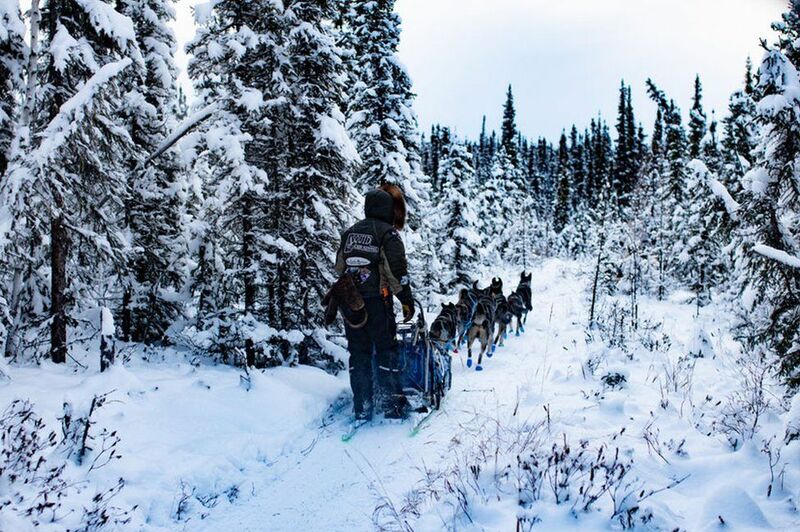 The Iditarod and Yukon Quest are 1,000 miles (1,600km) each and famed for their difficulty. It’s no mean feat for humans, but these dogs are quite special. During a full day the dogs are burning up to 10,000 calories. To keep them in top form they’re treated like high-performing sportsmen. A high-protein, high-fat diet coupled with daily massages and physiotherapy routines preserves their health. And the love from their owners and companions keeps them motivated. But in recent years it’s been difficult here. 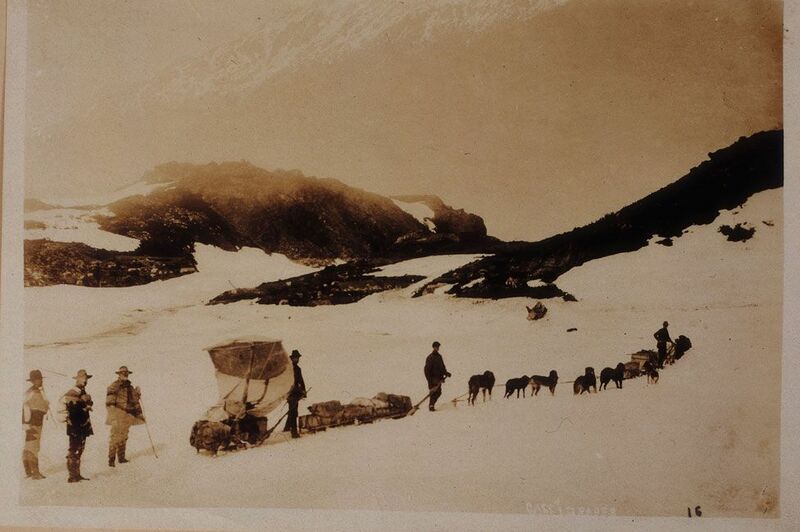 The smooth, deep snow required to run the dogs at full strength is late to arrive. John Gaedeke has lived in Alaska his entire life and runs high-end holidays in the mountains to the North of the state. Mountain sports, dog sledding and running snow-mobiles are par for the course, but he’s seen big changes in recent years. “Safe winter travel occurs later each year, in some communities rivers may never freeze,” he says. For Cody and Paige this boils down to one thing – rougher trails, later training schedules and less time for the sport they love. Beating through the trails, John at the reins of our battle-weary snow-mobile we’re reminded again and again of the increasing difficulty a lack of snow causes in this part of the world. A beeping from the control panel alerts us to a lack of snow beneath the tracks, overheating the engine and all but thwarting our attempts to catch up with the dog teams. 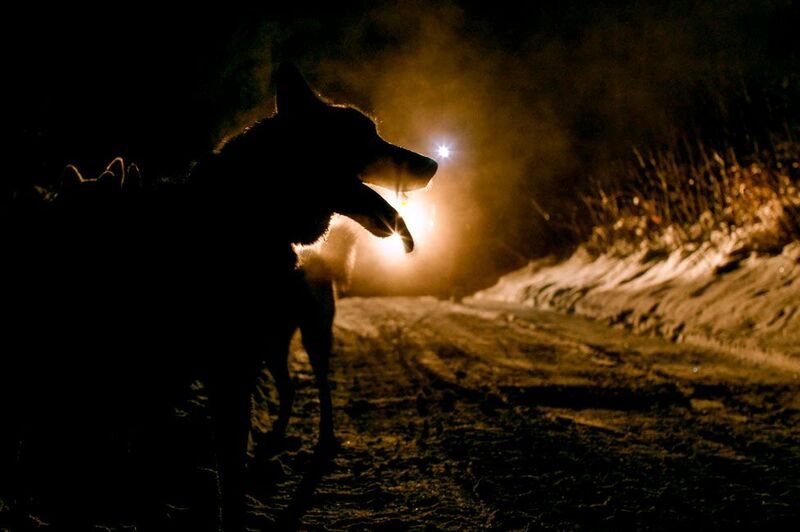 Headlights illuminate a string of dogs in front of Cody’s truck. The jutting frozen branches pierce the side of the trail. The frozen tundra is an inhospitable place at the best of times but tonight it’s akin to a Stephen King book cover. “Currently we have some snow but it’s not enough snow to run a big team safely,” says Cody. 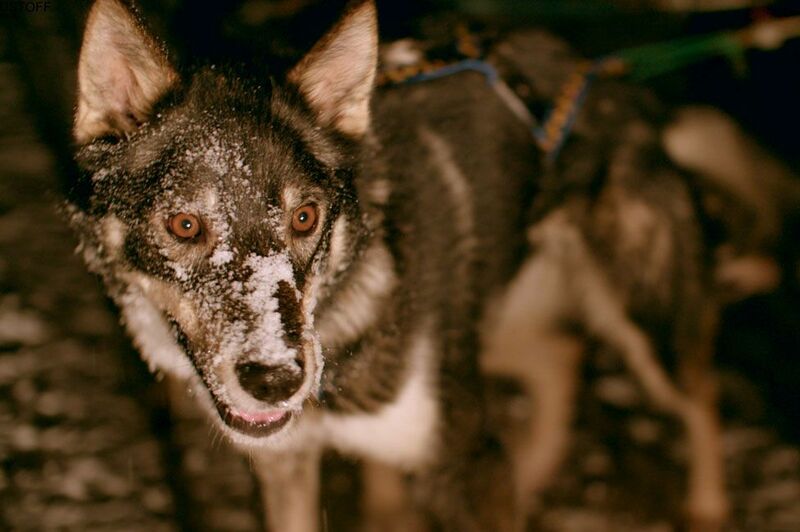 “We have to have enough snow to cover all the bumps that throw the sled around and we don’t want a dog to step in a hole and cause a shoulder injury or something.” Without sufficient snow to run a full dog team safely, they attach the dogs to the front of the truck, using the vehicle’s brakes to keep them under control. But this new configuration makes Cody feel distant from the huskies he adores. 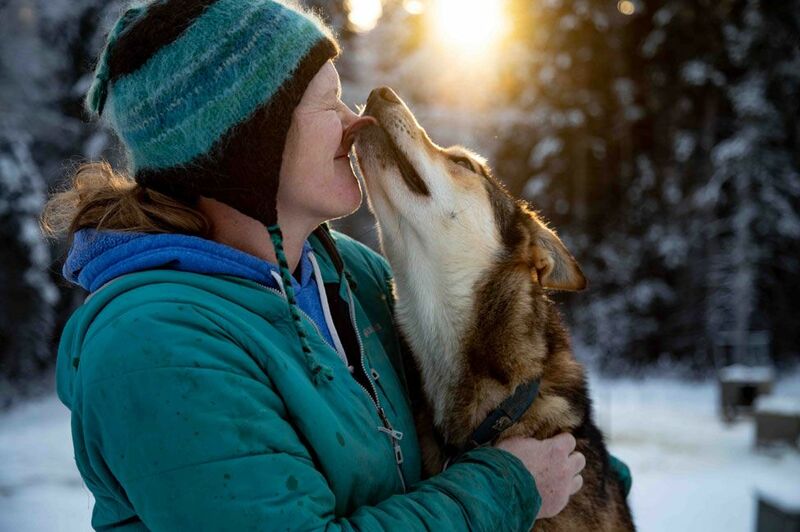 “They still love it, they get to run outside and smell the smells but it’s not as interactive for the musher [driver], when you’ve got a windshield between you. “It’s more like running dogs on a treadmill, so it’s a great training tool but not the kind of thing you want to do every day”. 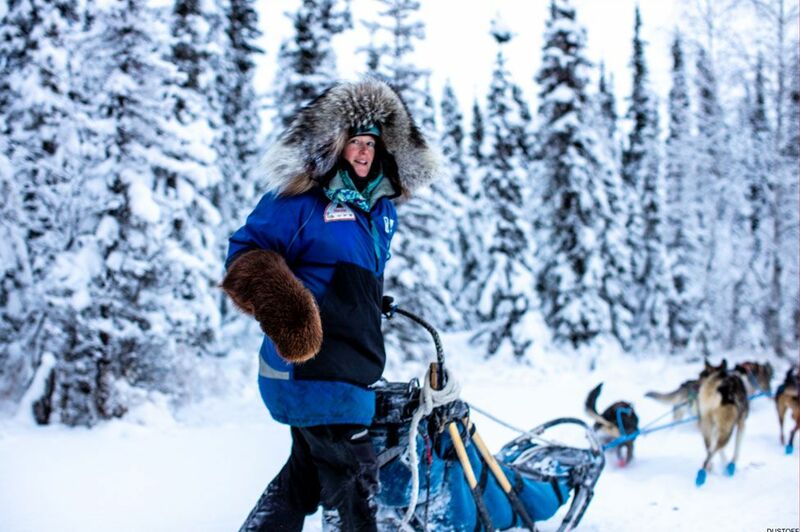 They feed off the energy of the musher, normally clinging on to the back of the sledge. The pitch of Paige’s voice helps keep the dogs excited but Cody has to raise his two octaves to encourage them up to race speed. Cody leans out the window into the darkness to shout commands, Ha for left, Ji for right. This has become the only way to train the dogs at the strength they require for the races. Fourteen sled-dogs is the minimum to be competitive. Cody tells us they’ve even taught the dogs to stay to the right of the track to prevent incidents with oncoming traffic. Squid Acres Kennel, named after Paige’s PHD thesis on squid, is at the top of its game Paige and Cody started it because of a love of dogs, but they quickly fell into competition and now often finish within the top few teams. It’s a tradition dating back hundreds of years. A reliable form of travel, now becoming more difficult. 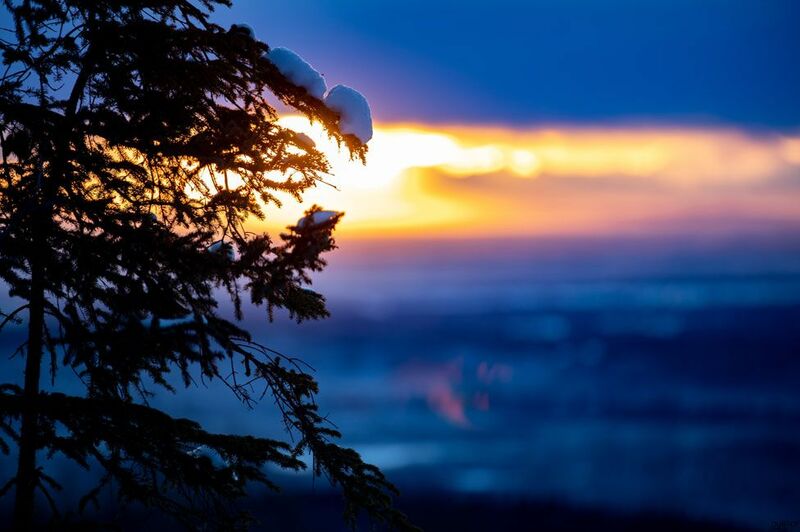 Many people move to Alaska to escape the modern, busy world. But now it seems the world they escaped is changing centuries-old traditions – far away from the big cities. The relationship between man and dog predates our rising temperatures. And the thought of losing the frozen tundra that fostered that special bond is as terrifying as the looming, vast forests Cody trains in.